You don't actually have to be talking or texting on your cellphone to get a distracted driving ticket, a B.C. judge has ruled. Never mind texting or talking behind the wheel, just holding a cellphone in your hand is enough to warrant a distracted driving ticket, a B.C. judge has ruled. It's a lesson Samuel Austin Bainbridge learned the hard way. Bainbridge was driving a white Ford Explorer through Kelowna last September when police noticed he was carrying his phone and dinged him with a $368 fine. The driver chalked the incident up to "force of habit," and the officers involved admitted they never saw his lips or fingers moving as he held up both the phone and his wallet. Bainbridge tried to challenge the ticket in court back in January, arguing he should be let off because B.C. 's distracted driving law only requires that motorists "not use an electronic device while driving." He said simply holding a phone isn't really "using" it. But Judge Brian Burgess disagreed. "Holding the phone in a position in which it may be used, is use," Burgess ruled in his March 18 decision. "There does not need to be proof of any operation of the device's functions." The judge pointed to a similar case last year where another driver was ticketed after plugging his phone into a charger while stopped at a red light. That decision ended up hinging on the definition of "use" as well, and set a broad precedent. According to the 2017 judgment, "even the momentary holding of the cellphone or electronic device is prohibited. It is a distracting event … The purpose of the legislation can be thwarted by one contending that one was in the process of charging the cellphone or electronic device and not using it." In the end, the specifics of how Bainbridge was holding the phone – in this case, in his right hand at the steering wheel – didn't matter. 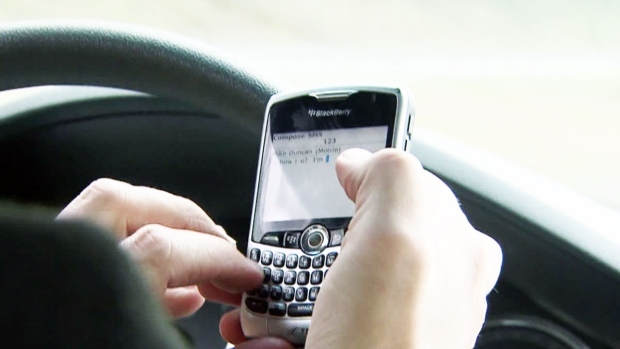 The court found he'd broken the province's distracted driving law beyond a reasonable doubt. Bainbridge was ordered to pay his ticket in full by the end of April.